Integrated in a park-like landscape, with its own cactus garden and surrounded by a beautiful natural stone wall is the Quinta dos Mochos II on one of the hills between the beautiful places of Moncarapacho and Estoi. From here you have a wide view over the countryside to the sea. The beautiful sandy beaches of Fuzeta Fuzeta and Iceland can be reached in about 8 km away, as the typical port town of Olhao, from where you can enjoy the island by ferry flair of Armona, Culatra or Farrol after a short time. Also, go on excursions to Faro or Tavira, one of the most beautiful towns in the Eastern Algarve. A car is recommended. 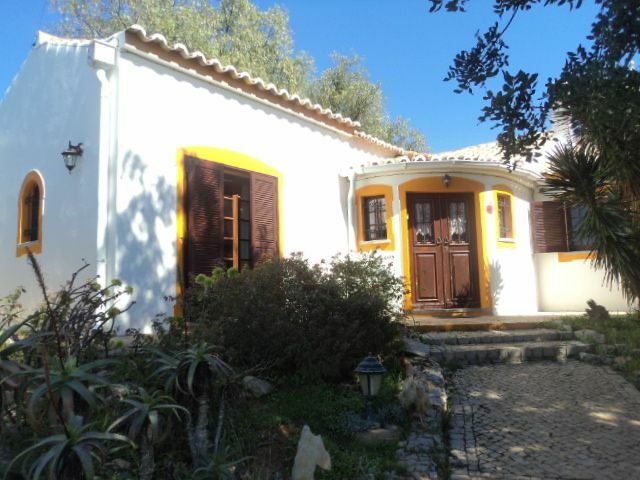 Your holiday home is built in Portuguese style and in all living areas with typical St. Catharina tiles designed. There are 2 double bedrooms and a large double bed and a children's youth bed and bathroom with shower and toilet. Bedrooms have spacious wood-paneled wall cabinets. There is also another large bathroom with bath shower, toilet and BD. The living and dining area with fireplace is spacious and adjacent is the open kitchen with stunning views over the garden and countryside. Adjacent to the living area is the beautiful terrace where you can relax with a view of the garden and with a clear view to the sea. In other grounds include a barbecue area, and a large sculptural stone table located under a shade-giving carob tree where it allows guests to dine and tell me with a glass of typical Vinho Verde. They also expect a 10mx5mxT2. 5m large outdoor swimming pool, where they refresh themselves at any time and let your soul can. Your holiday home is ideal for families with 2 or 3 children, but also couples and groups up to 6 people will feel comfortable with us. For any questions, requests or suggestions, I am of course happy to assist in the languages ​​German and English, a little French and Portuguese.